Occasionally you'll experience a payment failure with member auto-payments. Card declines are almost inevitable as cards expire, members lack sufficient funds in their account, or due to potential risk based on Stripe's machine learning engine. Habu keeps track of declined card payments and provides you with the relevant information to resolve the issue. When you in the detailed view of your invoice you'll see a 'Payments' log where you'll be presented with (a) the reason for payment failure and (b) what steps need to be taken to resolve the issue. This information is provided directly by Stripe. You can read more about the reasons for card processing failures here. For you to update the member card details, go to the member profile and make sure that you have the member and their card next to you. When you select 'Show Card' you can then 'Edit' and 'Save' the new card details. You'll now be able to retry taking payment when you return to the detailed invoice screen. 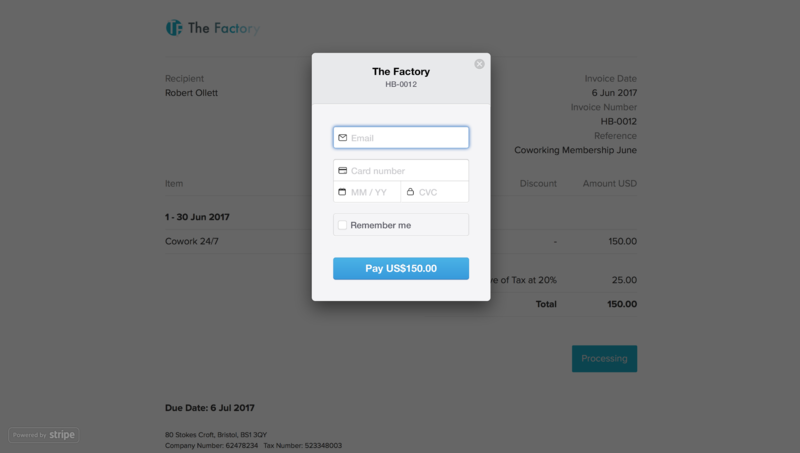 Members can update their card details by viewing the invoice that they have been emailed by using the 'Pay Now' button on the bottom of the invoice. When they've pushed the 'Pay Now' button, a dialogue box will appear and they can update their card details.